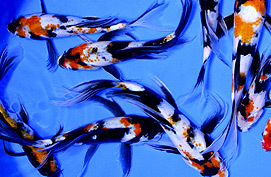 Butterfly koi have gained immense popularity in the U.S. since their introduction over 20 years ago. And it all started right here at Blue Ridge Fish Hatchery. On left, fish that resemble the original Indonesian long-fin carp. 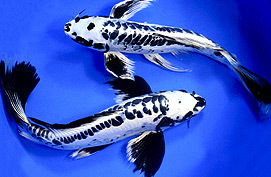 On right, premium select grade butterfly koi, selectively bred over the course of two decades. Since the 1950’s, Blue Ridge Fish Hatchery had grown into the nation’s leading producer of koi and goldfish. Like any growing business, we were constantly searching for ways to expand our product line. An opportunity seemed to present itself when we noticed an ad offering long-finned koi for sale. We placed an order and waited anxiously for our new koi to arrive. Initially, we were quite disappointed. The dozen fish in the box were not koi at all, but appeared to be wild carp with long, flowing fins and a simple gray or brown color. We have since learned that these fish came from a feral population of carp that inhabited the ditches and canals of Indonesia. Seemingly, no one knows the origin of these fish, their exact species, or how they acquired the long fins. Although they were interesting, we did not see any commercial value in these fish. Frankly, they were ugly. However, we decided to place them in a protected pond and grow them out to maturity. What a fateful decision that turned out to be. Two years later, we had only four of the original fish left. Each of them had grown tremendously, now weighing between six and eight pounds each. We were still convinced that there was no commercial value in their current state. But what would happen if we crossbred them with our existing koi stock? Could we transfer their fin traits to produce colorful koi with long and flowing fins? We decided it was worth a try. Two female long-finned carp were placed into a two-acre production pond with two of our best Gin Rin Ogon male koi. We eagerly awaited the spawning and subsequent hatching of the hybrid fry. The offspring proved to be very strong and grew rapidly. However, at only a few inches in length, they looked mostly like wild carp with long fins. Not the results we were hoping for. Amid our disappointment, we discussed culling the entire pond and putting it to better use. Ultimately, we decided to allow the hybrid fish to remain in the pond until the end of the growing season, another fateful decision. As they grew larger, some very interesting fish began to appear in the mix. A small percentage of them turned into beautiful fish with bright, vibrant color and long, flowing fins. Some of them had the long fins, coupled with a luminous, metallic glow that could be described as “pearlescent”. While admiring them in a small show pool one day, Randy LeFever (now the co-owner and president of Blue Ridge Fish Hatchery) exclaimed, “They remind me of butterflies”. We realized that we had some diamonds in the rough, and a great name to market them under. Male and female Kikokuryu butterfly breeding pair. Kikokuryu is the newest variety that we are in the process of developing. We were ecstatic at the commercial possibilities of this new type of koi. However, we were also worried that these hybrids may be sterile, as is often the case when crossbreeding two species. We would have to wait two years to find out. The highest quality fish were selected from the initial spawning and grown to maturity. Once grown to sexual maturity, the very best of the first generation hybrids were stocked together in a breeding pond. The pond was monitored very closely, and an excellent spawn and hatch resulted. Our two years wait had paid off. They weren’t sterile! The fry grew very rapidly in spite of being rather crowded. We noticed that they had hybrid vigor, which often results when crossbreeding two species. However, at about an inch in length, the prospects did not look great for these fry. Just like the initial crossbreeding, all of these offspring were quite ugly, with a dirty brown or gray color that resembled wild carp. Learning from our first spawn, we gave them time to grow and mature. Sure enough, by the end of the fall, when they had reached 3 to 5 inches in length, some beautiful butterfly koi had begun to appear in the mix. We were now convinced that we had a new product on our hands. With further selective breeding, we would go on to produce butterfly koi that, unlike traditional, standard fin koi, are beautiful when viewed from the sides as well as the top. They swim with such grace and regal bearing, and make a truly beautiful pond fish. Additionally, they are stronger, hardier, and more disease resistant than either common goldfish or standard fin koi, due to their hybrid vigor. developed right here at Blue Ridge. We later learned that a very fine and beautiful strain of long-finned koi had been developed in Japan. The Japanese had used the same Indonesian long-fin carp to develop their long-fin koi or “water dragons”, as they are known in Japan. They likely began their hybridizing program before we did, but that remains up for debate. 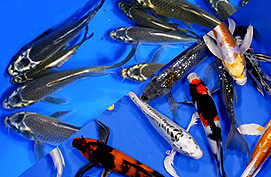 We were able to obtain some of the Japanese long-fin koi and crossbreed them with our butterfly koi. The resulting offspring displayed some beautiful new colors and patterns that had never been seen in koi before. The metallic underlay in the skin and fins is carried to the extreme. Also, the gin rin (sparkling diamond scales) displays more prominently than in standard fin koi. Since our initial crop of butterfly koi was hatched over two decades ago, we have gone on to selectively breed the butterfly fins into nearly every variety of koi. We now produce some extremely rare and beautiful varieties of butterfly koi, including Showa, Sanke, Kohaku, Utsurimono, Asagi, Shusui and Kumonryu, just to name a few. We are extremely proud of our butterfly koi stock and the prominent position that butterfly koi have obtained in the American koi industry.